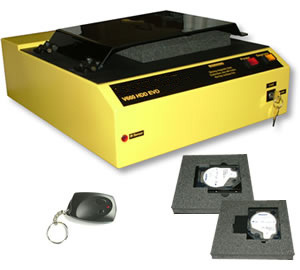 The V660 HDD Evo is a high energy, degausser especially designed to eliminate all data from computer, laptop and server hard drives. The V660 will also erase data from high coercivity tape, including LTO, DLT, Super DLT, AIT and more. Hard drives are completely erased in just 20 seconds, making it the fastest hard drive degausser available. Hard disc drives are placed on the V660 HDD EVO Hard Drive Degausser eraser within the special adapter, the lid is closed and the degauss button pressed. To meet the latest NCNIRP Magnetic Exposure Safety Guidelines, the V660 HDD EVO Hard Drive Degausser can be operated remotely via the infrared control. The unit can also be locked in the manual or remote operation position by removing the key.